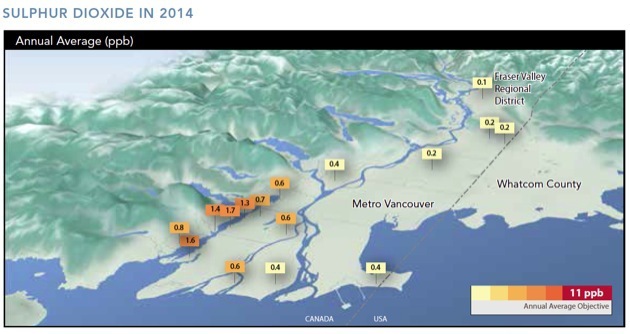 The Chevron petroleum refinery in Burnaby is Metro Vancouver's largest industrial emitter of sulphur dioxide. Metro Vancouver has imposed its own tougher limit on sulphur dioxide air pollution rather than waiting for a new regulation to come from the federal government. Metro’s new ambient air quality guideline sets a maximum acceptable level of sulphur dioxide at 75 parts per billion averaged over any one-hour period. It replaces the previous limit of 174 ppb that had been unchanged since the 1970s that regional officials said did not go far enough to protect residents in densely populated areas. The new standard, approved in a May 15 Metro board vote, is an interim one pending further review after an expected new federal standard is developed. The new lower limit would have resulted in close to 10 exceedances a year over the past five years had it been in place, mainly at a testing station in Burnaby’s Capitol Hill neighbourhood near the Chevron oil refinery. Chevron officials had expressed concern that the change could force costly upgrades of their Burnaby refinery, which is the region’s biggest industrial emitter of sulphur dioxide. Metro, however, intends to initially apply the new rule only to new and significantly modified sources, which exempts Chevron for now, provided it doesn’t embark on a major upgrade. Metro officials say their limit is more stringent than a federal one of 70 ppb under consideration because the federal methodology strips out the worst violations and averages results over three years. They also aim to develop a real-time alert system for the public to advise when sulphur dioxide levels are high in certain areas. High levels of sulphur dioxide can aggravate asthma and other respiratory problems. They can also contribute to smog, acidify soil and water, damage crops and trees and discolour structures and property. Sulphur dioxide emissions in the Lower Mainland have plunged 79 per cent over the past 10 years, mainly due to an internationally regulated switch to low-sulphur fuels by marine ships.